Today’s Crocodile Trophy stage into Mount Mulligan was decided with a gripping sprint finish. Repeating yesterday’s result, Cory Wallace claimed the victory ahead of Mark Frendo (AUS) and Jiri Krivanek (CZE). Liesbeth Hessens increases her lead in the female general classification. 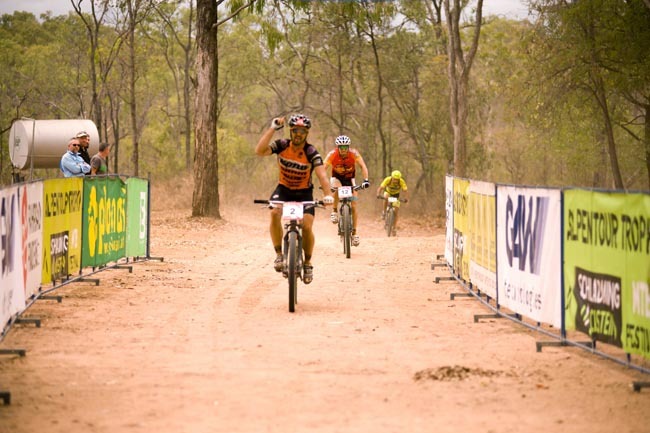 The fourth Crocodile Trophy stage took riders out of the mining town of Irvinebank to Mount Mulligan Station via the historic Bicentennial National Trail across the Stannary Hills. The first section of the race track was very rough with a steep ascent and tough downhills and only the quad crew was able to accompany the riders with medical, media and organisational staff. The Master 1 racer leader Mario Färberböck from Austria attacked right from the start and got away. “I knew that my only chance to be in the lead group towards the flat end of the race was to create a gap in the beginning”, he said. When the trio of Wallace, Frendo and Krivanek eventually caught up to him just before the first feedzone, the young bike shop manager from Salzburg hung on for dear life through the Mareeba region mango, avocado and pineapple orchards before heading north on wide gravel roads. “Honestly, I was really suffering and was cramping, trying to stay on their wheels. So I’m a bit surprised that I was able to stay with them until the finish”, he added. When the Czech rider Krivanek kept attacking on those last hills, Wallace and Frendo answered the challenge by pushing hard and the lead group of four stayed together even in the rough bushland through Pinnacle Station, just before Kingsborough. On the 20km of undulating gravel road to the finish line, the four racers put up a fight and Wallace was the only one who knew how to race into the last finish corner. “I lost the stage win here last year and I wasn’t going to have that happen again. I knew to take the inside line and that was all I needed”, he said at the finish. Frendo and Krivanek crossed the line in second and third with Färberböck crossing as today’s fourth and winner of the Master 1 category. One of the oldest racers in this year’s Crocodile Trophy, Master 3 competitor Peter Selkrig (AUS), crossed the finish line ex aequo in fifth with M2 racer Hans Planckaert (BEL) and Johan Schrauwen (BEL) as well as the elite racer Patrick Schörkmayer from Austria. As 16th overall he will pick up his fourth stage win boomerang tonight. “I was going to take it easy today, but couldn’t help myself but to give it all again, when I saw a fellow M3 racer in the chaser group with me. We were able to get away from him and rode together so well – the four of us decided to roll across the finish together”, said the ex-pro road racer who only two years ago returned to racing with a mountain bike and who added that he really enjoyed the camaraderie among Crocodile Trophy racers in the Australian Outback. The Australian Mark Frendo held onto his race lead and after today’s stage four and has a gap of almost 11 minutes on Wallace and more than half an hour on the Czech Krivanek. He wasn’t going to let it get to his head though. “We still have a long way to Cooktown”, he said. Steve Rankine, the Fastest Australian-leader jersey holder had bad luck today – racing right at the front, chasing the lead group hard and even catching up to them, he had a flat tire with 10km to go today and lost 21 minutes because of it. He finished in 6th place in the elite category, still, however, defending his fifth position overall and proofing yet again that riders have to be switched on until the last day at the Crocodile Trophy. Riders are bracing themselves for tomorrow’s king stage over 163km and 3,000m of elevation to Granite Creek Dam.